It is quite a misconception that painting aluminum gutters is too demanding a task to be done by oneself. 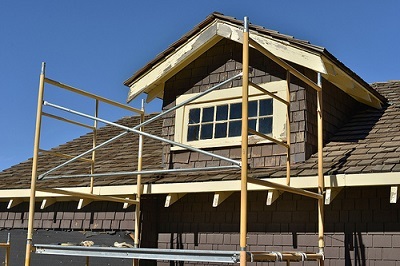 While it is true that the painting task necessitates some degree of preparation and effort, it is not out of reach of any homeowner’s capacity for exterior painting. 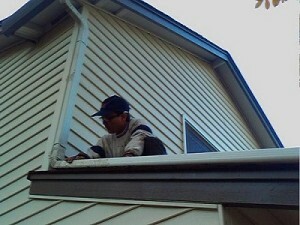 Listed below are the rudimentary steps of painting an aluminum gutter unit. 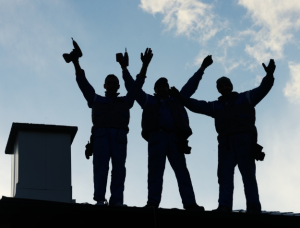 Before you start painting your gutters, make sure that you have a clean surface to work with. Washing them with a power washer is easier and more convenient and will save you more time. You could either rent a power washer or buy one at a hardware store near you. However, make sure that your gutters are not severely rusted prior to using the power washer as it can be detrimental to their condition. 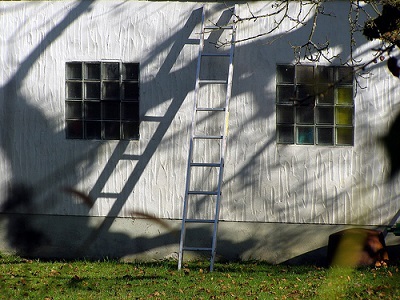 Stand on a secure ladder to get as close as you can to the gutters and rinse them thoroughly to remove all the dirt, debris, or flaking paint. Also make sure to get to all the corners and joints. If you don’t have access to a power washer, you could wash your gutter unit by hand. Make a solution using mild soap and water and take a brush with gentle bristles and wash it using swirling motions. Wait for a few hours to let them air dry before you paint over them. Additionally, if your gutters were infested by mold or mildew, you can add mildew retardant. You can buy this product at a hardware store or online. Before painting your gutters, make sure to prime them first. For this base material, clear acrylic bonding primer will yield optimal results. 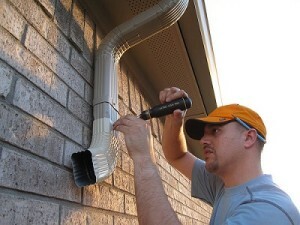 Apply the primer on the dried, clean surface of your gutter thoroughly to coat them in an even layer of the primer. After that, wait for the primer to settle down and dry. As mentioned before, be certain that the surface is completely dry before you prime or paint. After approximately 48 hours have passed, you can proceed with applying enamel. The best enamel for this material would be an oil-based high-gloss one. This enamel will add a layer that is favorable for fast rainwater flow. Once the first layer of enamel has dried down, add a second layer for extra protection. Again, you would have to wait for 48 hours for the enamel to have dried completely before proceeding to paint the surface. Make sure that the paint you have settled on is compatible with your primer and your enamel. Select a good-quality 100% acrylic paint. This paint should be devoid of ammonia as it can react badly with the aluminum surface. You can even choose one with UV protection to minimize the risks of sun damage. Make sure you take the necessary precautions to avoid getting paint on surfaces other than your gutter. Additionally, make sure that the weather is conducive to your painting- execute this task when there is bright sunshine and pleasant breeze so that the paint dries quickly. If you live in the GTA area and are in need of premium quality aluminum gutters, you can count on Century Aluminum Services to provide you with the best units and excellent customer service at unbeatable prices. How Do Gutters Protect Your House Value? We all agree that the first thing people notice about a house is its exterior appearance. You might be focusing on the perfect interior design or luxurious appliances, but do not forget about the gutters. If you do not have them, install them. 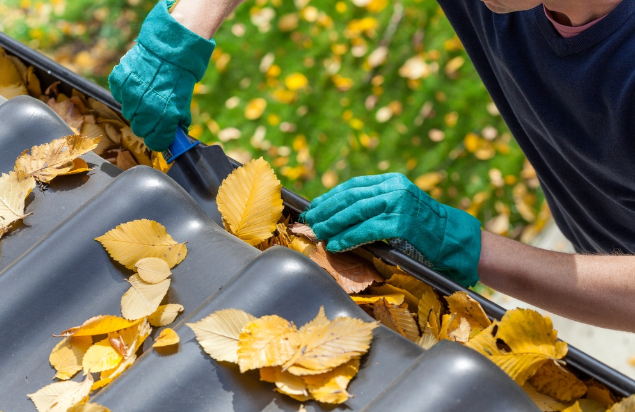 If you have gutters, take care of them on a regular basis. It may not seem like they are a big deal, but they do actually help to protect your property value. Gutters will protect you from a lot of damage. You will be safe from internal seepage that will eventually lead to a flooded basement which would have led to mold formation and insect infestations such as mosquitos. You would have saved yourself and your family a trip to the hospital when your gutters are installed right. In addition, the odds of passing your home inspection are high. You will then be able to get a good price for the house. When a buyer comes by, the first thing he or she will notice is the front yard. Having installed the gutters, your garden will be protected from excess water. The front walls of the house will look as good as new; flawless walls without cracks. They will send an inviting message to all and match the well-designed interiors. This is meant to dazzle any serious buyer and will help you hit your desired house price with better chances. Even with installed gutters, you need to ensure they are in a great state. Faulty gutters may ruin your garden fixtures and plants and cause paddles. It is also a health measure, as it protects you against attacks (from brutal disease bearing insects) that occur due to stagnant water. Rain is a blessing but if you neglect gutter installation, it may turn into a curse. Water seepage has several consequences. Did you know that gutters can save your house foundation from eroding? If you have well maintained gutters you will have your foundation in rock-solid shape. Formation of cracks will also be minimal which means the house will retain its original form. You will be saved from the need to block the cracks. Indoor flooding is a great issue given that there are no outlets and can be a cumbersome affair. You will be free from that too. Moist surfaces are great conditions for growth of mold and other form of water borne bacteria. It is very unsightly but you will not have to worry since you have already ‘ducked’ that one. Most people tend to remodel their houses’ interiors and landscaping to match trending designs. You may also need to crank up your gutter game for your house to be one that people envy and want to have at the same time. Lead by example because you know what is good for your house and the better the state of the house, the better the selling price. So remember that whenever you want to protect your property value, gutters are a must to be installed and maintained well! Gutters are an important addition for the house. They protect you from the horrible effects of water seepage that may erode your house’s foundation. You will be able to reduce the risk of flooding in your basement, infestation and breeding of insects and formation of molds. Your house gets to look good for a long period of time with a lesser risk of cracks in the walls. It is only logical that the gutter will be able to cover every square inch of the house, from the bird’s eye view. A professional will need to calculate the square footage of the roof by using a tape measure. If you have a simple roof, this will not take a lot of time. If you have a complex roof, the gutter expert may need a longer time to calculate the exact measurement. The average times that it rains in a given time period can be used to determine the size of your gutters. In an arid region, you may need small gutters since even when it rains, the amount of water will not be a lot. The same goes for regions that experience normal rainfall. For regions that experience heavy rains such as Toronto, a larger sized gutter should be installed. With frequent rains, you may need a large one so that it is easier to maintain and avoid overflowing. There are two common types of gutters used in most households. They include the 5 inch K-style gutters alongside the 6 inch half round gutters. Gutters in Toronto should be wider, given that the rain in this region is very frequent and is quite intense. This applies to houses with large and steep roofs. K-style gutter are designed for smaller roofs. You will also need to consider the roof pitch factor which is finding out the steepness of your roof. The steeper the roof, the greater the rain collected. This indicates the need for larger and wider gutters. The smaller the slope, the lesser the water collected and you will only need a regular gutter. It is measured using a two foot level and a tape measure. One end of the level will need to be against the roof. Leveled, it then measures the distance between the roof and the middle of the level. This measurement is known as the twelve inch run. If the measurement is 10 inches, it will be known as the ten in twelve inch run. Using a pitch factor scale, you will now be able to determine the roof pitch factor of your roof. You will be advised accordingly by your gutter specialist on which one to choose. This is an element that is affected by all other reasons. You need to consider how much water it can handle for you to enjoy the benefits of the right sized gutter. A small gutter will not be able to hold the water and end up spilling the rain water over, and you will need to change the whole system once more. Having an oversized gutter, though handy, is quite unnecessary and will cost you more. Before installing or replacing your gutters, ask for professional assistance to confirm that you are getting just the right size for your gutters. 5 Things You Need To Know Before You Hire An Eavestrough Installation Company! Before you hire any contractor, you need to make sure that you have done your due diligence on them. You need to be confident that the team you hire will be able to do the job right, using the correct materials and not cut any corners. This is especially true when you’re looking to hire a contractor to update or repair your eavestroughs in Toronto, Oakville or Mississauga. So, how do you choose the best eavestrough replacement and repair specialists? We’ve put together 5 tips to help ensure that you get the right team for the job. 1. How long has the eavestrough company been in business? If the eavestrough installation team have been in business for many years then you can be reasonably sure that they are good at what they do. Many contractors rely on word of mouth in the Toronto, Oakville and Mississauga area to find work. You don’t want to hire a company that has just started as there will probably be a learning curve. The installation and repair of eavestroughs require specialized skills and a level of knowledge and experience that can take years to learn. Hiring a company that is local means that you will be able to hold them accountable and find them easily should any follow up work or additional services be needed. You may be so thrilled with the work that the team based in Toronto, Oakville and Mississauga have done that you want to have them come to your home to work on the siding, soffit or fascia of your home too. Local businesses take a great deal of pride in the work that they do, they know that the work that they do will be seen by other potential customers so will work as hard as possible to ensure that they leave your home looking spectacular and remain professional throughout the entire process. 3. Do they have eavestrough installation specialists? As you are doing your research and looking around for the best possible deal, you should keep an eye out for companies that specialize in the installation of eavestroughs. This is a clear indication that they will be able to provide the level of service that you need. A company that has team members that focus on one area of home improvement can give you a much more specialized service and superior quality. When it comes to something like your eavestroughs you need to be certain that the finished job is perfect. If there are leaks or shoddy workmanship you are risking significant damage to your home. 4. Is their team 100% in house? Ideally, you want to have the company that you hire to be the company that actually does the installation. If outside contractors are brought in this can cause breakdowns in communication and make the whole process a lot more stressful. It is possible that the subcontractor is not as reliable or experienced as your research on the company that you have hired is. This is a big red flag and you should make sure to ask this question during the early discussions with your eavestrough installation company. Google is your friend here, in just a few clicks you will be able to find a long list of reviews for the eavestrough installation company that you’re looking at. This is a great way to find out what people think of the work that the contractor has done and how they found the overall experience of working with them. You can also ask the company directly for testimonials and pictures of their previous work. Having eavestroughs properly installed into your Toronto, Oakville or Mississauga home will provide the protection you need from water damage and landscape erosion. Eavestroughs are needed to divert water away from your home. Water can be very destructive if allowed to pool or drain near your walls. Take a good look at your rain gutters or eavestroughs, if you suspect that they may not be doing their job well it may be time to upgrade them. Here are seven reasons why it may be time to consider an eavestrough replacement for your home. If your eavestroughs have not been installed correctly or have been allowed to fall into disrepair then your basement is at great risk of flooding. If any water is allowed to enter your home this can cause damage that is very expensive to repair. Even a little bit of moisture in the insulation of your home can cause mould to build up. The fascia of your home gives that finished look. When properly installed and maintained the facia of your home can look fantastic and really elevate the value of your home. Eavestroughs that are doing their job will protect your fascia and keep the curb appeal of your home intact. If the eavestroughs and gutters are allowed to get clogged they will then pour large amounts of water onto the fascia, this can cause a great deal of damage and cause the once beautiful fascia of your home to start looking very bad in no time. If you have noticed any pools of water forming on your driveway from water dripping from an eavestrough, you should get your eavestroughs repaired as soon as possible. Water can do a lot more damage than people think in a really short time. If an eavestrough has been incorrectly installed or has become damaged over time you may find that the concrete of your driveway can become bowed or start to break down. Once your driveway has cracked it is just a matter of time until the damage gets worse. Standing water is never a good idea as it can attract insects which can make your once comfortable outside space not so pleasant. Mosquitoes can be a big problem in the summer months, If your eavestroughs have not been doing their job and pools of water have formed you may find this summer to be especially mosquito heavy. Having your eavestroughs tended to before any other damage is done to your home is a quick and affordable fix for any home. By simply having an eavestrough specialist come and take a look at your home you will be able to have the peace of mind to know that water is being directed away from the vulnerable areas of your property. The solution to your eavestrough woes might be something as simple as a small adjustment or you may find that a full installation of new eavestroughs is in order. Whatever your needs, it is best to be proactive with any aspect of your home’s construction. By addressing the problem now you will not need to worry about larger and more expensive repairs later on.